Moderation, balance, and proportion. In many areas of life these are some of the most important things to bear in mind, and most of us learn the hard way that plenty of excesses are to be avoided! It’s as true of menswear and tailoring as anywhere else. When menswear excesses are indulged in, they do leave a visible mark. They are always a fad which can be immediately spotted when looking at old photographs; the heavily padded shoulders of the 1980s, the skinny lapels and trousers of the 1960s Mod scene, and the wide wing-like lapels of the 1970s, paired with dowdy fabrics and flared/bell-bottom trousers, of course! Taking the moderate route, although not flashy, is always the surest path to an item of clothing which won’t date, one where, in the future, looking at photos of younger self won’t have you wincing. And much more importantly, that same suit will look just as good as it did 20 years ago! It’ll be something you can continue to wear, giving it a much longer lifespan. This is all about timeless elegance, which by nature isn’t about being in-your-face different or flashy, it’s about being calmly, coolly, understated and refined. Chest size up to 38"
Chest size 36" - 50"
Notch and peak lapels are not at risk of becoming outdated in either case, as they’re both long-standing components of smart menswear and tailoring. However, there are a few things worth considering in terms of how they impact a suit. Notch lapels - stay conservative. The notch lapel is the standard go-to lapel for your typical two-piece or three-piece lounge suit, being a middle-ground between casual and formal, and is suitable for nearly any situation or occasion, so it’s a safe bet if you’re not sure of things or if you just want a traditional look. Peak lapels - go bolder. Peak lapels have their origin with the more formal-end of men’s tailoring and do have a very sharp, powerful look that draws attention. Peak lapels are an integral part of a double-breasted suit jacket, itself a “power” item of clothing, and are also a key part of Black Tie formal wear on dinner jackets and Tuxedos. If you want a statement piece or a more formal ensemble, go with peak lapels, however, if you’re not sure, or if you want to use the suit for something more casual, or a job interview, opt for notch lapels. Contrary to what some may say, your lapel width and tie width don’t need to match, and a quarter-of-an-inch difference here and there is not going to be all that noticeable. However, with that said, it is advisable to choose similar proportions and keep things in the same ballpark - we don’t recommend pairing a very skinny tie with a wide lapel, or vice versa, for example. 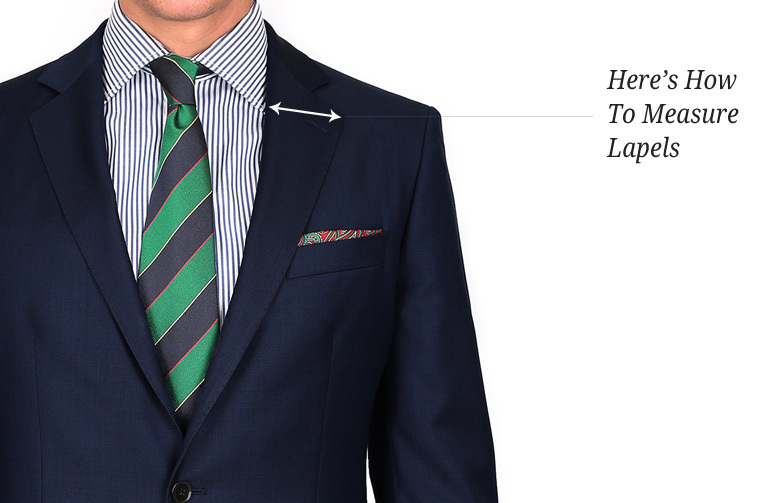 As with lapels, the width of the tie should generally reflect your build.